Dentures are false teeth. You need teeth to chew your food, so people who are missing some or all of their natural teeth as a result of decay or gum disease must replace them with dentures. Technology has allowed laboratories to craft very convincing false teeth. Most of them look great, on a dentist’s desk or sitting in the palm of your hand. However, no matter how beautifully made or well-fitting your dentures are, they will never feel or function like natural teeth. Traditional dentures are essentially foreign objects placed in your mouth and expected to behave as if they are a part of you. 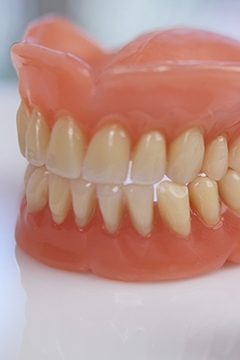 The biggest issue with dentures is that they will always- no matter how highly-customised and well-fitting they are at first – always become loose. Once your natural teeth are gone, the gum and bone where they used to sit starts to recede as they have nothing to ‘live’ for. This shrinking and recession continues throughout your life. Putting dentures on the upper or lower jaw doesn’t make any difference- the gums and jawbone keep getting smaller and thinner. 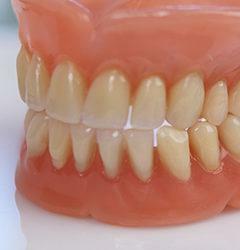 Dentures made to fit your gums at one point start to get loose as the gum and underlying bone shrink. There is nothing to hold the dentures in place; dental fixative is notoriously ineffective in the warm, damp environment of the mouth. They start to slip; causing problems with speech and eating. They become uncomfortable and unreliable. The only way to make dentures a true part of you is to support them using dental implants. A dental implant is placed into your jawbone to act as an artificial tooth root, and your jawbone accepts and embraces it, growing around the implant to fuse with it completely in a process called ‘osseointegration’. Once the implants have fused with your own bone, you can attach those beautifully crafted dentures and they will behave like natural teeth, because they are now part of you thanks to the fusing of the titanium implant post into your jaw. There are several ways to attach your dentures to your implants, and Smile Store will help find the most suitable method for you. Implant supported dentures will change your life. You’ll be able to eat crunchy, chewy foods without limitation. Your speech will be unimpeded and the correct positioning of teeth with implants allows your cheeks and lips to be supported correctly at all times, unlike traditional dentures which cause skin sagging and puckering when the dentures are removed. When Can I Get My Dentures? Once the dental implants have been placed, they need a few months to heal and integrate with your jaw. You’ll be given a temporary denture to wear during this period whilst your fully customised implant-supported dentures are being made. Your permanent, implant-supported dentures will be created to fit perfectly onto your implants, looking completely natural and providing you with correct, even bite pressure. Any adjustments or fine-tuning can be easily performed until you are perfectly comfortable with your new implant-supported dentures. You will quickly become used to eating and speaking with your new implant-supported dentures in pace, without ever having to worry about them again. It is very important to adopt a good dental hygiene routine at home once you have your new implant-supported dentures, and to care for them as if they were your natural teeth. Brushing and flossing must be maintained as you must prevent the build-up of plaque and tartar to avoid gum disease, taking particular care around the gumline. We provide warranties on all of our work here at Smile Store, and we advise you to come back to see us for regular check-ups to ensure your gums are healthy. You should get a professional dental cleaning at least once a year to keep your beautiful new implant-supported dentures in great condition and to ensure your general dental health. 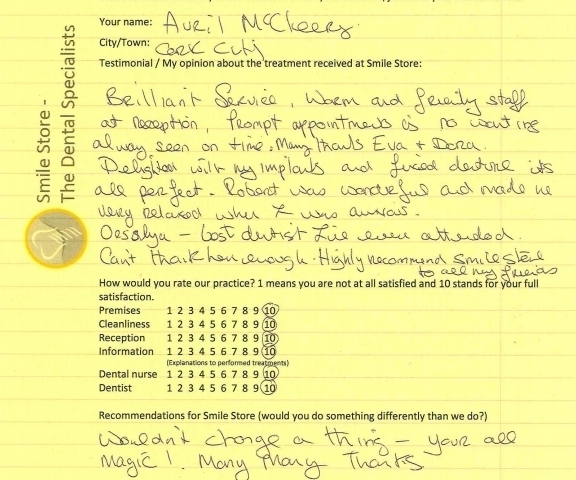 In my opinion the treatment I had at Smile Store was the best I ever had from a dentist anywhere. 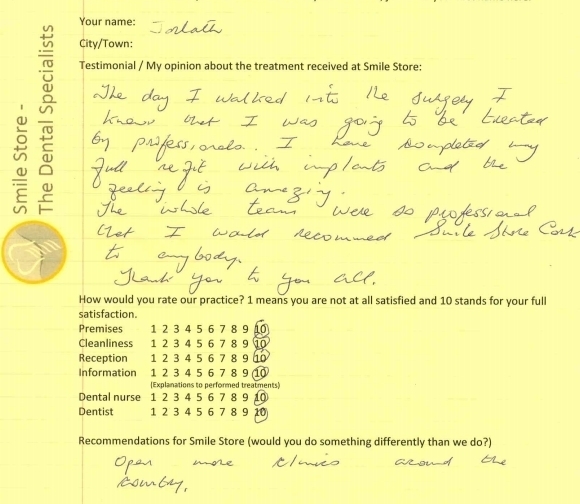 “Following many years of coping with a denture which was not properly made I at last have the perfect denture…thanks to Smile Store, from my first consultation with Doctor Ben and other members of the team my treatment has been highly professional, friendly and with Tamas at reception my visits were timely and relaxed.